You are currently browsing the archives for the Kitchens category. « Spice Up Your Showers! Kitchen and Bath Warehouse sells the supplies you’ll need for projects in those areas. They also have a blog and a collection of articles with helpful advice. This entry was posted on Monday, July 27th, 2009 at 12:01 pm	and is filed under Bathrooms, Kitchens. You can follow any responses to this entry through the RSS 2.0 feed. You can leave a response, or trackback from your own site. This entry was posted on Friday, March 6th, 2009 at 11:21 pm	and is filed under Countertops, Furniture, Kitchens. You can follow any responses to this entry through the RSS 2.0 feed. You can leave a response, or trackback from your own site. Greentea Design has some plans for renovating your kitchen cabinets. The designs are Asian. It is meant for renovating the entire kitchen, but has prices for individual cabinets. This entry was posted on Saturday, February 28th, 2009 at 11:46 pm	and is filed under Cabinets, Kitchens. You can follow any responses to this entry through the RSS 2.0 feed. You can leave a response, or trackback from your own site. Dwyer Kitchens sells appliances for the kitchen. They have a unit called the Temp Kitchen with an oven, dishwasher, sink and microwave for all purpose simple cooking. This entry was posted on Saturday, February 14th, 2009 at 10:51 pm	and is filed under Appliances, Kitchens. You can follow any responses to this entry through the RSS 2.0 feed. You can leave a response, or trackback from your own site. I want to point out this photo by Richard Perry of the New York Times. It’s from an article about the renovation on the top floor of a townhouse in Harlem. Don’t let it scare you that the renovation in the photo cost oodles of money (he renovated the whole flat, plus the outdoor area). My point in showing you this photo is how exquisite white cabinets can look. Yet they can be the least expensive to buy. 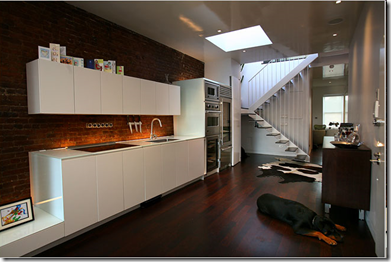 You can take ideas like this and use part of them in your renovation projects. What I like in the design below is the simplicity of it – it’s very elegant! Even a person on a budget could pull off a simple, chic look. Take white… add one other color for the floor and backsplash (and possibly the countertop) – in the photo the other color is brown… and you have a timeless look. No matter how styles change, the kitchen in the photo below won’t look outdated. This entry was posted on Monday, January 26th, 2009 at 6:49 pm	and is filed under Cabinets, Countertops, Flooring, Kitchens. You can follow any responses to this entry through the RSS 2.0 feed. You can leave a response, or trackback from your own site. There are two main issues when buying appliances in a house where young kids live: aesthetics and safety. 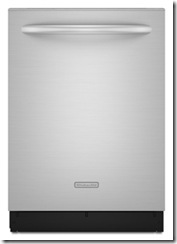 The main aesthetic issue is how well the surface of the appliance will hide or show fingerprints and smudges. Little kids put their little fingers and hands on everything. Their marks will show up more on stainless steel and black appliances. There are some appliance surfaces that hide fingerprints better than others. Some brands now use a special stainless steel material that hide marks – on the traditional stainless steel marks will show up right away. You can usually tell when you walk into the appliance department which ones will be a problem. They’ll be all marked up with prints. But you can test them out yourself by putting your hands on them (better that you know in advance). Unless you’re the type of person who doesn’t mind wiping down your appliances every day, keep this in mind when you’re buying. The other appliance issue with kids is safety. Some appliances now come with locks built in so that young kids can’t open the doors. If you’re buying a new stove, I’d recommend buying one with the knobs at the back of the stove where young kids can’t reach them. Also, make sure to anchor your stove into the wall. Finally, ensure that your kitchen has all GFCI outlets. This entry was posted on Friday, January 23rd, 2009 at 2:46 pm	and is filed under Appliances, Kitchens. You can follow any responses to this entry through the RSS 2.0 feed. You can leave a response, or trackback from your own site. 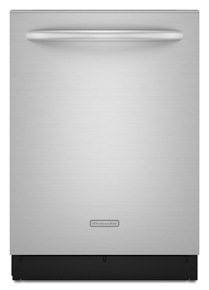 One feature I’ve decided I’d like in my new dishwasher is a stainless steel interior. The alternative is plastic. A plastic interior is more likely to break down harmful chemicals into the water supply, onto your dishes and into the air you breath when the plastic gets hot. Stainless steel will also aid in the quicker drying of your dishes and it’s more durable. Once you have your dishwasher, make sure you use a dishwashing detergent that’s free of phosphates. Phosphates are harmful to aquatic animal life. You can read more about Green Dishwashing at Planet Green. This entry was posted on Thursday, January 22nd, 2009 at 1:40 pm	and is filed under Appliances, Green Homes, Kitchens. You can follow any responses to this entry through the RSS 2.0 feed. You can leave a response, or trackback from your own site. Unfortunately, I’m in the process of looking for a new dishwasher. My current one is only 5 years old. It’s an Amana and it’s very loud. We have to leave the room for the first hour it’s running. The bottom rack wore down in places and the plastic came off. Now the metal underneath is exposed and has turned rusty. It leaves rust marks on my white dishes. I had a repair guy come in. It cost $125 for him to just walk in the door. He said the cost of just the parts to fix the machine would be a couple hundred dollars. He thinks that at this point we should just buy a new one. I looked at the Bosch dishwashers in the store and noticed that that racks have very small slots for plates and bowls. The guy in the store measured them and they were only an inch apart. My dishes are deep and won’t fit into the Bosch machines. I’m on to researching other machines. The KitchenAid dishwasher looked good. It was stainless steel inside (as opposed to plastic) and the slots for dishes were wider. So, next I’ll research KitchenAid and some other brands. This entry was posted on Thursday, January 22nd, 2009 at 11:27 am	and is filed under Appliances, Kitchens. You can follow any responses to this entry through the RSS 2.0 feed. You can leave a response, or trackback from your own site. I recently mentioned how my built-in soap kitchen dispenser broke. I must say I panicked! Not really, but I was annoyingly inconvenienced each time I went to use the liquid dish soap. It made me realize what a wonderful feature a built-in kitchen soap dispenser is. When you have one, you no longer need to have an ugly soap bottle on your kitchen countertop all the time. Plus, you have continual, easy access to soap. If you’re planning on replacing your kitchen faucet you should consider buying one with this great feature! This entry was posted on Friday, August 1st, 2008 at 5:39 pm	and is filed under Kitchens. You can follow any responses to this entry through the RSS 2.0 feed. You can leave a response, or trackback from your own site. Here’s more discussion about how various faucet companies stand behind their products. This entry was posted on Wednesday, July 30th, 2008 at 2:53 pm	and is filed under Bathrooms, Kitchens. You can follow any responses to this entry through the RSS 2.0 feed. You can leave a response, or trackback from your own site.